<div class="col-lg-4 col-md-4 col-sm-4">Hello, I am Mustajab Hussain. 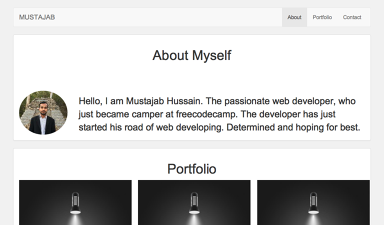 The passionate web developer, who just became camper at freecodecamp. The developer has just started his road of web developing. Determined and hoping for best. Hello, I am Mustajab Hussain. The passionate web developer, who just became camper at freecodecamp. The developer has just started his road of web developing. Determined and hoping for best.